Preventer Plus Flavor Tabs are given just once a month to prevent heartworm disease and flea populations in dogs and puppies. Controls flea populations and adult hookworms . Removes and controls adult roundworm and whipworm infection in dogs and puppies. Preventer Plus Flavor Tabs (milbemycin oxime + lufenuron) are available in four tablet sizes in color-coded packages for oral administration to dogs and puppies according to their weight. Each tablet is formulated to provide a minimum of 0.23 mg/lb (0.5 mg/kg) body weight of milbemycin oxime and 4.55 mg/pound (10 mg/kg) body weight of lufenuron. Milbemycin oxime consists of the oxime derivatives of 5-didehydromilbemycins in the ratio of approximately 80% A4 and 20% A3 Milbemycin oxime is classified as a macrocyclic antihelminthic. Lufenuron is a benozylphenylurea derivative and classified as an insect develpoment inhibitor. IndicationsPreventer Plus Flavor Tabs are indicated for use in dogs and puppies, four weeks of age and older, and two pounds body weight or greater. 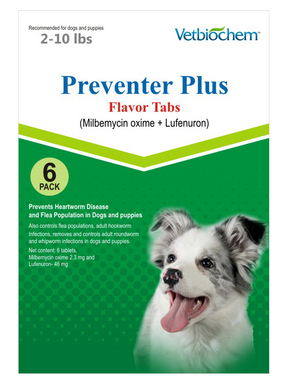 Preventer Plus Flavor Tabs are indicated for the prevention of heartworm disease caused by Dirofilaria immitis, for the prevention and control of flea populations, the control of adult Ancylostoma caninum (hookworm), and the removal and control of adult Toxocara canis and Toxascaris leonina (roundworms) and Trichuris vulpis (whipworm) infections. Lufenuron controls flea populations by preveting the development of flea eggs and does not kill adult fleas. Concurrent use of adulticide product may be necessary for adequate control of adult fleas. DosagePreventer Plus Flavor Tabs are given orally, once a month, at the recommended minimum dosage rate of 0.23 mg/lb (0.5mg/kg) milbemycin oxime and 4.55 mg/lb (10 mg/kg) lufenuron. Dogs over 100 lbs are provided the appropriate combination of tablets. AdministrationTo ensure adequate absorption, always administer Preventer Plus Flavor Tabs to dogs immediately after or in conjunction with a normal meal. Preventer Plus Flavor Tabs must be administered monthly, preferably on the same date each month. Treatment may begin at any time of year. In geographic areas where mosquitoes and fleas are seasonal, the treatment schedule should begin one month prior to the expected onset and should continue until the end of mosquito and flea season. In areas with year-round infestations, treatment should continue through the entire year without interruption. If a dose is missed and a 30-day interval between dosing is exceeded, administer Preventer Plus immediately and resume the monthly dosing schedule. If Preventer Plus Flavor Tabs replace daily diethylcarbamazine (DEC) for heartworm prevention, the first dose must be given within 30 days after the last dose of DEC.
PrecautionsDo not use in puppies less than four weeks of age and less than two pounds of body weight. Prior to initiation of the Preventer Plus Flavor Tabs treatment program, dogs should be tested for existing heartworm infections. Infected dogs should be treated to remove adult heartworms and microfilariae prior to initiating treatment with Preventer Plus Flavor Tabs. Mild transient hypersensitivity reactions manifested as labored respiration, vomiting, salivation and lethargy, have been noted in some treated dogs carrying a high number of circulating microfilariae. These reactions are presumably caused by release of protein from dead or dying microfilariae. Preventer Plus Flavor Tabs immediately break the flea life cycle by inhibiting egg development. However, pre-existing flea populations may continue to develop and emerge after treatment has begun. Based on results of clinical studies, this emergence generally occurs during the first 30-60 days. Therefore, noticeable control may not be observed until several weeks after dosing when a pre-existing infestation is present. If a Preventer Plus- treated dog comes in contact with a flea-infested environment, adult fleas may infest the treated animal. These adult fleas are unable to produce a viable offspring. The temporary use of an adulticide product may be necessary to kill these adult fleas. This product works! ya'll must give it a try, you'll save a lot and you'll definitely get your babies protected from harm. You're like hitting two birds in one stone! Perfect! Never seen a flea on my outside dogs! I have two labs that stay outside. With this pill I have had only 1 tick in 6 months and have never seen a flea on my girls! Very much worth it! These parasites are now afraid of this medication, they should be!! How great is our love to our Pets so thank you Pet Shed for providing real great meds! Liz is a yorkshire about 9lbs did love the product. I can't afford the name brand sentinel anymore as I have a limited income. being old is somehow hard but the beauty of life won't stop just because I am old. I'm doing my responsibility for my baby Liz in the best way I can. I'm so emotional right now but I'd like to thank Pet Shed for this opportunity. I've been a customer for years and I trust pet Shed. Thanks a lot! I like the notion of saving money but getting the most from what you spent. This pretty works just like the one made by Novartis. It targets 3 in one tab!! So easy to purchase! Very affordable and it works! Thank you! No heart worm, no fleas! super happy! This prevention works well with the Generic Capstar you guys are selling. These is once a month and fights fleas to prevent them from sprouting like a useless grass, I'm loving this product but I'm hating the parasites. This one works for me aside from the savings it's working on my pets! I think they like this. I'm glad that I chose to buy this meds, knowing your pets are safe and protected is the most satisfying feeling a dog-owner could have. I have this so-called peace of mind. Thanks Pet Shed for making life much easier! !